In our kitchen we have a lot of dead space between our cabinets and ceiling. I am not into decorating above the cabinets with ivy and knickknacks so I have just left it bare. I have always loved the idea of putting rows of cake plates on top, but the space is so high it would have lost the impact. 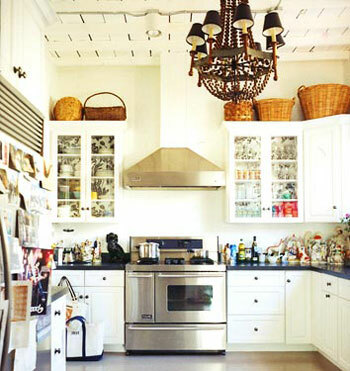 Some time ago I came across this image and saved it into my inspiration folder, I recently came across it again and became quite enamored with the baskets above the cabinets. I love the natural feel it brings without any fuss. So this brings me to our kitchen. I have started my basket collection. I have two so far and rather like how it fills in the dead space. So if any locals come across any lovely baskets for great prices then be sure to let me know. These two came from Home Goods. Also my wall paint color is reading a bit more yellow than it should in the shot. 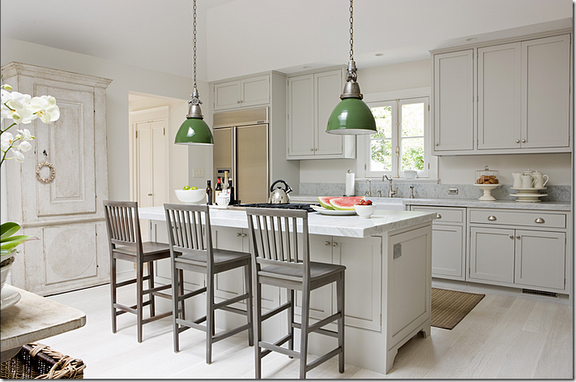 I swear it's because it's the color of the cabinets (more accurate color interpretation found here). My wall color is sherwin williams rice grain. Doug I am sure you will be so excited to hear I am back on my wanting to paint kick. We are in this home for the long haul so I mine as well make it the best that it can be, right? I am thinking this would make a superb birthday present to me. I know this color would go with my decor quite nicely. Any of you know a color like this that you absolutely love or if you think I am going in the wrong color direction let me know? Also has anyone used Farrow and Ball? I would love to hear your thoughts! Thank you all for your sweet comments on my last post. You all had me blushing. I suppose a picture or two a week would be no big thing.